Fly. This song was used in the soundtrack to the "quirky" 2001 film The Royal Tenenbaums. It uses the very unusual combination of acoustic guitar, acoustic bass, viola, and harpsichord. The lyrics are simple and the tone of his voice combines with the instruments in a very elegant way. Another song with a classical music infusion is "Cello Song." Once again, a simple, sparse sound with some percussion, acoustic guitar, acoustic bass, vocal, and cello. The last song I will share is a short instrumental piece called Introduction...the first cut from the Bryter Layter album. It features an acoustic guitar backed by a string ensemble. Very beautiful. Very "classical." 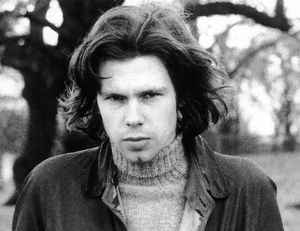 It is hard to describe Nick Drake's music, and I am not going to try and compare it to anyone else. You can do that for yourself. But I love his music and wish that he had lived longer to continue to write and record. He died in 1974 from an overdose of medication he was taking for depression, a condition he battled his entire life. His music has gained recognition and appreciation in the years since his death. It is sad he was not appreciated during his lifetime. I hope you find his music as fascinating and fulfilling as I do.